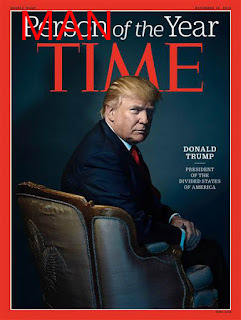 Donald Trump is Time Magazine's "Person of the Year" and I for one have to take issue with that for I believe Time Magazine should change the title of this year's pick back to "Man of the Year" for Donald Trump. I mean, from 1927 to 1999 each year Time Magazine used the title "Man of the Year" to describe such men as Adolf Hitler, Richard Nixon and Ayatollah Khomeini (before such things became silly to say in polite company); therefore, I say give The Donald his due: The Donald is not polite, he is rude, crude, unsympathetic to the needs of others, and very rich: yes, a true Man. So come on Time Magazine, call him what he is: a Man, because to call him a person is very insulting to the rest of us who identify ourselves as such. Labels: News, YOU KNOW THAT'S RIGHT!